I spend quite a bit of time in email on my phones and I’ve come to the conclusion that there are only two things that really matter in the usability of a mobile email application; speed and click distance. Speed, as in the number of seconds it takes to delete or file the current message and load the next. Click distance meaning how many key presses it takes to read and manage my mail. I’ve been primarily using the gMail Java application to keep up with high volume mailing lists because it’s fast and there are hot keys for everything, minimizing clicks. I also occasionally use Yahoo’s mobile webmail to manage personal email. It’s been about a year and a half since I did a survey of the mobile web mail landscape so I thought I’d take a fresh look and see if there’s anything new. It turns out that not much has changed. Most of the major mobile web email services have gotten face lifts but there has been little gain in performance or features. I tried AOL, gMail, Hotmail and Yahoo’s mobile offerings, counting key presses and timing loads and deletes. The data is summarized in the table below. All testing was done on a Motorola i855 on the Nextel network. I use Opera Mini for all my mobile browsing. It has no trouble loading full sized websites so I also tested the desktop versions of AOL Mail, Hotmail, gMail and Yahoo mail on the phone as well as the “PDA” edition of Mail2Web and the gMail Java application. Here’s what the numbers mean, Time is how long it takes to delete the current message and load the next, Clicks is how many key presses are required to get from the end of the current message to the first line of the body of the next message. Score is simply the sum of time and clicks, as in golf, lower scores are better. It should be obvious from the numbers that the gMail Java application is blazingly fast. The PC sites are a bit of a surprise, I expected them to be much slower, less usable and require a lot more clicks than the mobile specific ones. It didn’t turn out that way, with Hotmail’s PC version tying the mobile web gMail for second fastest and Yahoo beating Mail2Web. Of course, this is ridiculous. The mobile web versions should be much faster, they are loading pages that are between a fifth and a tenth of the size of the PC pages and are specifically designed for devices with small screens and restricted navigation It’s obvious that email providers are putting way more resources into making their PC sites fast, efficient and reliable than the mobile ones. None of the mobile web sites are very efficiently designed, there is much that could be done to reduce click distance. For example, when you delete a message in the web versions of both Hotmail and Yahoo Mail, the next message loads automatically, but in all the mobile versions after you delete a message you are dumped back in the Inbox and have to find and click on the next message manually, wasting time and clicks. Why? Note: AOL Mobile Mail didn’t work in Opera Mini, presenting a blank screen after login. Not everyone can run Opera Mini, It’s incompatible with some phones and a few carriers block it’s use on some or all data plans, so I also tested the mobile web services in the rather limited built in Openwave browser of the Motorola i855. Notes: gMail Mobile failed to load in the built in browser failing with the error “Bad Request – Error 400“. Mail2Web PDA‘s login form did not work with the built in browser, the correct password wasn’t recognized. Yahoo Mobile failed to work reliably with the built in browser returning “Yahoo! error Code: 004 – Can not retrieve source” about 25% of the time off and on over a period of 3 days. AOL‘s (standard and Beta) login didn’t persist across sessions. The performance of these mobile web services was even more disappointing in the mobile browser. The only one worth using with this browser is Hotmail. gMail and Mail2Web failed to work at all and Yahoo was frustratingly unreliable. AOL required re-logging in every time you used it in spite of the “Save Password” box being checked. The “clicks” results do show the value of accesskeys in reducing click distance, the built in browser supports accesskeys and Opera Mini doesn’t. Conclusions: Use gMail Mobile if you possibly can. It’s blazing fast and efficient. The only thing that keeps it from being perfect is that you still can’t apply labels to messages. gMail uses labels instead of folders for filing saved mail so I end up leaving email I want to file or reply to in the Inbox and then using the PC web version of gMail to do the labeling. If you can’t or don’t want to use the gMail Java client, all four of the major email servies (AOL, gMail, Hotmail and Yahoo) have at least one version that works reasonably well in Opera Mini. 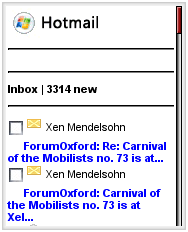 If you can’t use gMail or Opera Mini you are likely to find mobile web email somewhat frustrating. Hotmail users are better off than most as the mobile web client works reasonably well as does gMail’s (the Error 400 problem supposedly only occurs on the Nextel network). Yahoo seems to be having some server capacity or reliability issues currently with their mobile web platform – I hope they fix them soon as I use Yahoo quite a bit – although not from the phone. This entry was posted in Email by Dennis Bournique. Bookmark the permalink. – Access to email folders, files, contacts and calendar via Microsoft Outlook or any browser . – Attachment viewing: Excel, Word, PowerPoint, PDF, ZIP and image files. We ended up using 123together’s (http:www.123together.com) BlackBerry Enterprise Server. It is very fast as well. Have you tried flurry from flurry.com or push consilient? Great review, but if you are going to include Java clients you should look at Flurry too. I tried Yahoo GO on Symbian phones (Nokia N95 and Motorola Z8) and it was very sluggish. I’d think the Java version would be worse. What phone are you using? Thanks for the comment, Mail2Web is good especially if you have POP or IMAP access to a mail service that doesn’t have webmail or mobile webmail, I just wish it was a little faster. As for secure login, actually all the sites I covered have it. Great piece! You should really check out Yahoo! Go also, Yahoo’s Java client for mail (and lots more). I’ve found it to be a superior choice on the time/clicks front. 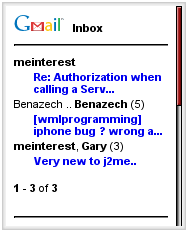 Thanks for the rundown… May I humbly point out that Mail2Wap/PDA works great on the native S60 browser.